At the Body Mechanix Gym in San Francisco, Joel Hornsby is the bona fide, certified "Mind and the Machine" master trainer. Can he be replaced by a videogame? 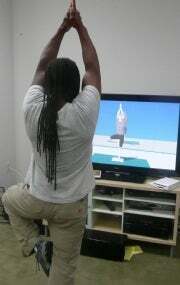 To help me find out, Hornsby was good enough to spend an afternoon testing four fitness-focused games for the Wii. 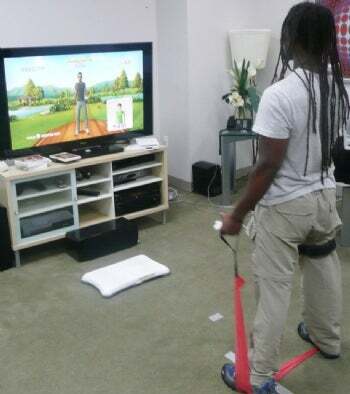 We set up a Wii balance board, then fired up some software to see what he thought of Jillian Michaels' Workout Ultimatum 2009, Gold's Gym Cardio Workout, EA Sports Active Personal Trainer, and Wii Fit (the Nintendo title that kicked off the videogaming/personal training craze when it launched a year ago). What follows are two perspectives--that of an an over-the-hill, out-of-shape Average Joe gamer (me), and Hornsby's professional opinion--to help you select the best-bet at-home game workouts for you. Average Joe: The first workout for me--the lateral eye-rolls. Jeez, the production's a little cornballish as Jillian Michaels (of The Biggest Loser fame) welcomes me to this digital boot camp in her own sassy idiom. The deal here is to get sweaty with nontraditional activities. That is, unless your average day includes throwing paintball grenades and log-jumping while on the river. As you exercise, you're treated to music that'll make you want to run away from your TV. Hey, so I guess that means its working, right? With the balance board plugged in, he was a little down on running. 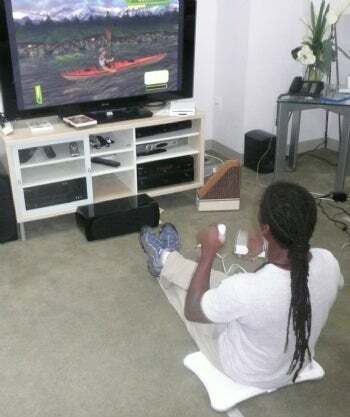 "When you're trying to simulate running, you shouldn't bother using a balance board. The issue with running in place is that you're only really calculating moving up and down as opposed to that and going forward. It's not going to give you the same degree of exercise, as a general rule". And "running" on a balance board is even less effective. When Hornsby tried the kayaking exercise, the game didn't recognize his movements until he began wildly flailing to get its attention. So...it's the tantrum-throwing workout? "I really like the nutritional part of the package; but the exercises, poor directions on proper form, and bad animation make it tough to recommend." Average Joe: Not that I'm the shallow type, but I was turned off by this game for a couple of superficial reasons. Strike one is the cutesy anime characters in the gym. Is this the Naruto workout? If so, I'm not the target audience. Strike two (and a painful foul tip at that) is having to listen to the instrumental version of Survivor's "Eye of the Tiger" during workout sessions. Over. And over. And over. But once my ears cauliflowered over, I found that I was breaking a serious sweat while throwing more punches than Manny Pacquiao. The program offers a good array of cardio boxing exercises, but I can hear my internal doofus alarm going off (or is that Survivor again?) as I bounce back and forth to the beat, throwing punches without much feedback as to how good my form is. The Pro: Hornsby gives a thumbs-up on the actual boxing part: "The trainer's voices are annoyingly cute, but not bad." After trying a few of the balance-board-centric exercises, however, his verdict is more thumb-in-the-eye. In the push-ups exercise, for instance, Hornsby spotted some God-awful technique: "The way the animated character was demonstrating push-ups, it would put too much strain on the lower back. If someone followed that form, it'd be a bad workout and could hurt you in the end. That form should be way better. Notice how the character drops back a little during the push--the back was arching at the end of the movement. You're supposed to go straight down and straight up. The form should be correct on the animations; otherwise, the program misses the point. If form isn't dead-on, that's major points off, because you're teaching something wrong. The biggest problem here is that your [virtual] trainer--or at least the model that you're following on-screen is doing the workout wrong." Average Joe: Though I'm a proud couch potato, I must give points for an interactive session that not only gauges what I've done, but takes into account what I'm doing throughout the day (such as what I've been eating and drinking). For the most part, the activities avoid ridiculousness, and the music is highly customizable (and not bad). You don't realize how important little motivating factors like that are until you try a bunch of these games side-by-side. Though the resistance bands are a nice touch, they are best for beginners. Once you start working out regularly, you might want to buy some of your own to increase the challenge. If you like, you can hand-pick the exercises you want to try on any given day. But I'm gonna leave that to the pros (fitness guru Bob Greene is one of the motivators behind this game) and give the 30-day Challenge built into EA Sports Active a proper test-run. The Pro: "Obviously there's more of an interactive experience when you're with a real personal trainer that can see what you're doing and help adjust the exercise or form. But EA does get points for trying," says Hornsby. "I really like the incorporation of extra equipment to focus the upper body exercises and factoring them into the workout," he adds. The measured workouts did a good job of incorporating difficult-to-translate exercises. However, the bent rowing exercise, as translated to Active, left Hornsby a little concerned. "They had to modify the form a little in order for it to work when you're looking at a TV. As a result, the proper form and animation looked a little off." Still, this program was in another league from the first two: "The form in the tutorial videos prior to each activity looked good. And it was clear to see what they wanted. What would've been helpful: Being able to see the workout from different angles so that you'd know if you were performing all the activities correctly. Why not just have a video window with the proper form that you follow?" 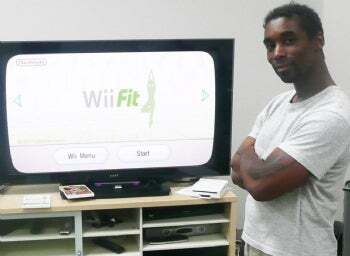 Average Joe: Wii Fit has always been a challenge for me because I have zero balance. You know that bull in the china shop? It's more coordinated than me. And the whole point of the Eastern-focused Wii Fit is to maximize work on that balance board--it's the only workout game that requires it. So as much as I respect the game, I've found it tough to use. But at least my Zen state (and balance) have drastically improved since my first Wii Fit sessions. The Pro: As far as form and correctness go, the first balance board game is still the best. "One of the bigger parts of our job is teaching people how to exercise correctly, and Wii Fit showed the best form," says Hornsby. He tried out a couple of the activities, did some strength training and then cooled out with some Yoga. Hornsby especially liked the ability to see the workouts from different angles--a feature that the other games lacked. Plus: "Balance is a big part of Wii Fit and that's what I find many people need a lot of help with in workouts." But Hornsby did have one problem: "I think that grading people by BMI is misleading. By BMI specifications, Michael Jordan is obese. It doesn't differentiate between muscle weight and fat weight. Bone mass structure and body type are going to be different for a football player and a volleyball player." 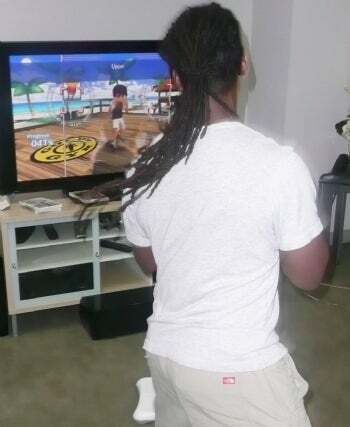 Oh, and for his initial test, his Wii Fit "age" was 45. He's nowhere near that. Hornsby had to give props. "I'm glad people are doing this; just the fact that games like this are creating a platform for kids to be more active is great. Games are a different level of accessibility over workout DVDs, and because you can track information in the game--and interact with it--makes for a very cool implementation." It reaches people that you otherwise wouldn't get. One beef that the human trainer kept bringing up was the games' reliance on a calorie-counting score. The problem is that the calorie counter may not be correct for a particular person: The estimated number of calories burned and the number you're actually burning probably aren't the same. If these games could somehow tie into a heart-rate monitor peripheral for additional data, you could get a much more accurate idea of your calorie burn rate. The software makers need to address that shortcoming in the next generation of these games. Besides, it's one more peripheral they can sell. Yay! Me? I'm leaning toward committing to EA Sports Active. I just want something that can help motivate me to whip back into shape...and yeah, if it's remotely fun, that wouldn't hurt either. As a low-cost starting point for a fitness program, Hornsby believes, the right game (or game combination) could work. His ideal game would be a combination of Eastern (Wii Fit balance-centric exercises with correct form) and Western (active sports with a proper training program), with some nutritional tips thrown in for good measure. In the meantime, he sees these interactive programs as representing a step up from home workout DVDs. But in view of the bad form that crops up all too often in the animations ("I can spot the differences pretty easily," he says), Hornsby doesn't have to worry about losing his job just yet. Need even more nerdity? Follow Casual Friday columnist and PC World Senior Writer Darren Gladstone on Twitter (gizmogladstone) for game-swag giveaways, odd links, and time-wasting tips.